The Story of Carol Bryan & J. Brian Boyd, M.D. Growing up, my physical appearance became an asset that opened many doors and became my main source of income. I started modeling at the age of sixteen and also worked in the beauty industry. 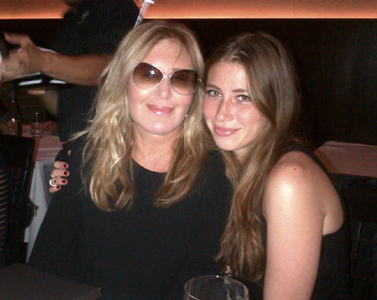 I had a beautiful daughter, a successful husband, and a loving and supportive family. From the outside looking in, it must have seemed like I had it all, but looking back now I see that my life was lacking so much. I have come to realize how truly deceiving looks can be and how precious every moment of life is. This realization took time and perseverance, but now I see that I was rescued and given new life, and I am certain that God was my hero. Although not initiated by me, in late 2009, I was persuaded that as a preventative aging measure, I have fillers injected in areas of my face. 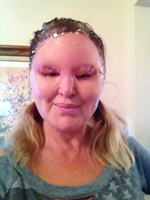 These procedures resulted in my face expanding, contracting, and becoming distorted. Once the initial damage was done, I was no longer able to go out in public. Corrective procedures worsened the damage, until one day, it was so bad I needed to hide my face - not only from the world, but also from my family and friends. After four frightening years of isolation and emotional and physical pain, in 2013, my daughter finally had enough of the secrecy, and brought me back to the world to get help. hospitals all over the country, but only one would take my case. Dr. Reza Jarrahy, Co-director of the UCLA Craniofacial Clinic, of the UCLA Face Transplant Program, and Associate Professor at UCLA, with amazing compassion, assured me that he would help, but made me fully aware that there were unknown risks. My case was unprecedented. I quickly realized I had to put my trust in him. Dr. Jarrahy made me feel safe at a time when I was so scared, felt so isolated and was extremely tired. He consulted with a panel of doctors, sharing my story and seeking assistance with the required surgeries. Only a single doctor was up for the challenge: one of the country’s most renowned microvascular surgeons, Board Certified plastic surgeon, Dr. J. Brian Boyd, a Professor of Surgery with the David Geffen School of Medicine at U.C.L.A. and Chief of Plastic Surgery at Harbor-U.C.L.A. Medical Center. This photo was taken immediately post-operation. 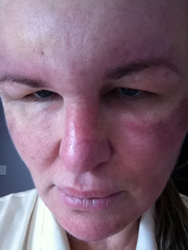 After the most risky of the surgeries I had undergone: a 16 hour procedure on my forehead, in which all of the muscles and tissues were removed, down to the bone. A large section of skin and tissue was removed from my back, and re-vascularized, in order to replace the damaged skin on my forehead. 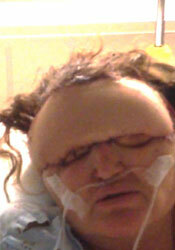 The surgeons had never done anything like it before, because of the the foreign material that was injected into my face. They weren’t sure whether or not the vasculature would be sufficient to keep the transplanted skin alive. Dr. Boyd is a highly skilled expert and has over 25 years experience in microsurgery. His compassion went above and beyond to help me, even against all odds! That is what makes Dr. Boyd extraordinary. This team of surgeons truly worked miracles. If it weren’t for their vast knowledge and expertise, I would still be wearing head scarves and holding the skin of my forehead up in order to see out of my left eye. I would still be afraid to leave my home. Despite all their most careful efforts, however, the initial surgery left me blind in my right eye; there could have been worse complications, so ultimately I am lucky to have only lost half my vision. My road to recovery has been an extremely bumpy road, filled with unknown risks, anxiety, and fear. Somehow, in facing these challenges, I was able to find within myself a courage and tenacity I never knew I had. I realize how unsatisfied I was. I was lonely. I was weak. I was unhappy. I had no idea what my purpose was in life. How is it that I feel better about myself now, than I ever did then? I learned how to open up and ask for help, and appreciate the love and support of my family and the many trauma therapists, the mental health professionals, and alternative therapies that have been made available to me. And it has taught me lessons about what beauty is and how important it is to show one’s true inner self to the world. Sadly, it wasn’t until I couldn't recognize myself that I realized true beauty begins on the inside. 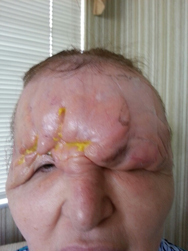 When Carol Bryan visited her cosmetic surgeon to try dermal filler in her forehead, she never could have predicted what would go wrong, leaving her with permanent disfiguration and temporary blindness. Carol joins Ryan Tubridy to talk about the long road to recovery, and why she’s learning to love herself again.